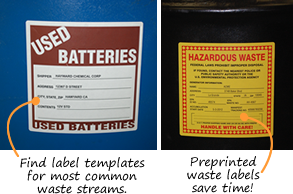 It could not be easier to order compliant and durable custom Hazardous Waste labels. • Both paper and vinyl labels are available. Vinyl labels feature an aggressive adhesive designed specifically for drums. • Do you need labels in a hurry? Or, do you need just a few custom Hazardous Waste labels? Design your labels online and generate free custom hazardous waste labels for PDF download. These are the most common Hazardous Waste labels. Personalize these labels and save time. Select versions that are designed specifically for New Jersey or California. Other states use the standard design.